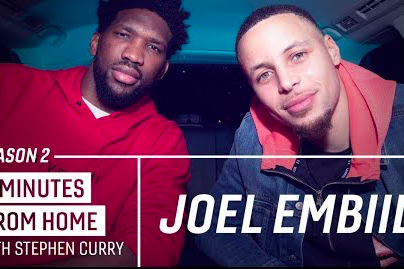 Philadelphia 76ers star Joel Embiid joins the Warriors' Stephen Curry for a ride around the Bay Area in YouTube series "5 Minutes from Home." Fresh off crowning himself "the most unstoppable player in the NBA," Sixers big man Joel Embiid made an appearance this week on the YouTube series of Golden State Warriors' star Stephen Curry. Now in its second season, "5 Minutes From Home" features Curry riding around the Bay Area with celebrities and fellow NBA players. The footage was filmed in January a night before the Sixers defeated the defending champions on a West Coast road trip. In the course of an entertaining conversation, Embiid reminded Curry of a horrific performance he had in a game last season in Philadelphia, shooting a miserable 0-11 from beyond the three-point arc. The Warriors somehow won that game 119-108, but Curry became just the fourth player in NBA history to make zero three-pointers while attempting at least 11. Embiid and Curry only recalled 10 bricks, but who's counting? As it turns out, Curry was sluggish that night because he ate too much great food in Philadelphia. His agent set up a dinner as an opportunity to get to know Embiid. They didn't reveal where they went, but Curry implied he got too full on Philly's culinary offerings and couldn't function properly come game time. The episode is full of funny and revealing anecdotes about both Embiid and Curry.